I know! It started as a what the heck post but I learned so much lol. It is sometimes surprising which posts get the most comments or the most likes. I have spent over an hour researching for a post and gotten a few likes. Then I write something right off the top of my head, that takes me less than five minutes, and it gets 25 likes. I never can tell what will happen. That is why I have learned to only research something if I would have wanted to, or it would help me somehow anyway. Otherwise I am better off just talking off the top of my head and typing it in. The post I wrote the other night about the walking Zombie mental illness took me over an hour and a half to research and write. I was interested in it because the disorder came up in the tv show Hannibal, which I was watching on Amazon Prime. When I first saw this post of yours, I thought it was so weird that they recognized that weird number. I would have written a nearly identical post, if it were me, so I thought your post was funny. It was interesting to learn that the number actually has significance. If you had not posted this, neither of us would know about that. Have a good night. I am getting ready to watch Hannibal. Aww thank you. Just my life lol. I always believe that all numbers have significance. For example, if you multiply 1337 by itself 1000 times (1337^1000) and reverse the digits of the answer, then you will get a prime number :). And 1337 is the smallest number of such pattern as well. for me, only exactly 700 to go! Very cool Katie! Thnx for sending that. I never knew this. So cool. Thank you for the link. Wow, odd but awesome! Great work! ha! i just gave you one more! Hahaha…I had that awhile back. I didn’t know what to think of it. How did u copy and paste it here ? SOOOO Arbitrary! I was so confused when I got that notice myself! No it’s a gamer # lol who knew? It’s still a good number. Way to go! 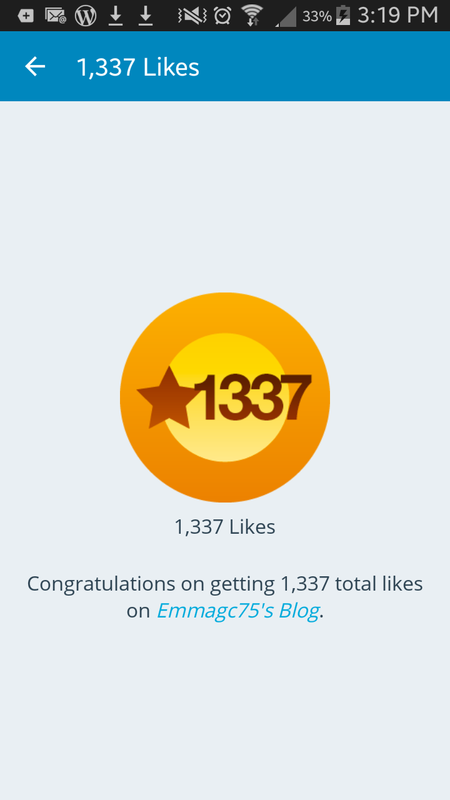 i guess you’ve earned 4 likes on this post, so that moves the target to1343.